The Blaine House is not only the home of Maine's Governors and their families: it is also a public building. As such, it is subject to constant use. While basic upkeep of the building is taken care of by state government, there are many aspects of maintaining the Blaine House and its grounds that have required private funds. In 1989, Governor McKernan and his wife Senator Olympia Snowe began a Blaine House restoration program that made many important improvements. It was aided by the formation of a Friends group and it is upon this foundation that the present Friends of the Blaine House seeks to build a permanent organization, dedicated to keeping and enhancing our pride in the Blaine House. 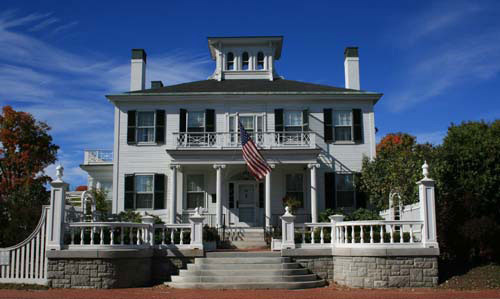 The Blaine House in Augusta is one of Maine’s most notable homes. In 1862, three decades after the house was built by Capt. James Hall in the early 1830s, James and Harriet Blaine moved in. The home became the setting for one of the most meteoric careers in American politics, during which James Blaine served as Speaker of the US House of Representatives, US senator, secretary of state, and Republican candidate for president in 1884. To become a member or to support our activities, please print and fill out this form. Tours of the Blaine House are coordinated through the Maine State Museum. Please go to their website to plan your visit. Which Maine Governors held office for only two days? Which Maine Governor was Baxter State Park named for? Learn the answers to these questions and more by viewing these pages about the 69 interesting men who have held our state’s highest office. Site designed and maintained by A2Z Computing Services.